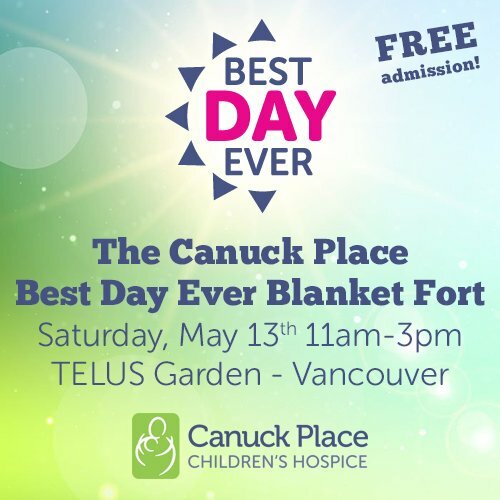 On Saturday, May 13, Canuck Place will transform the corner of Seymour and Georgia with the construction of Vancouver’s biggest blanket fort that will span almost 2,000 square feet. Event attendees will enjoy interactive musical performances, childhood culinary delights (like Earnest Ice Cream and Mom’s Grilled Cheese), and family-friendly games and activities. There will also be special appearances by Vancouver Canucks player, Daniel Sedin, and beloved Vancouver Canucks mascot, Fin. 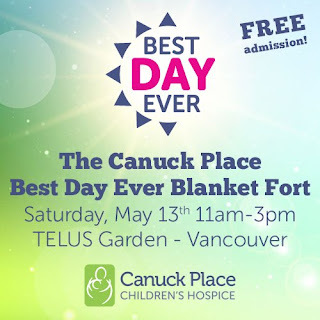 Best Day Ever celebrates the favourite ways that Canuck Place families spend time together, from quieter moments spent in the Canuck Place Hospice gardens to exciting adventures on recreation therapy outings. Join us on Saturday to reflect on and share how you would spend your best day ever. Daniel Sedin will be on-site at the fort and available for photos between 11:00am- 12:00pm to launch the event. Vancouver Canucks mascot Fin will be there from 12:00-1:00pm and available for photos. About Canuck Place Children’s Hospice: Canuck Place Children’s Hospice is British Columbia’s pediatric palliative care provider. Over 713 children living with life-threatening illnesses and families receive care from CPCH through outreach programs and two provincial hospice locations: Vancouver and Abbotsford. Services include medical respite and family support, pain and symptom management, 24-hour phone consultation support and in-house clinical care, music, art and recreation therapy, education, grief and loss counselling and end-of-life care. Through the investment of the community, our talented team, and over 300 energetic volunteers we make a lasting difference in the lives of children and the families who love them.